Building a house in Costa Rica is different than building in the USA or other countries you may be familiar wtih, in that standards are often different, materials are often different, and even if you know nothing about building you should probably read up a little and just BE there – at the building site – every day if possible – to make sure things are being done right. So it pays to be on site when you are building a house in Costa Rica, even if you have never built a house in your life. It also helps if you are there to choose options – so that for a little more money you can choose better quality materials. If you are there, for example, as you build your house in Costa Rica, you can ask the builder what’s next on the agenda. Kitchen and bathroom fixtures – when it’s time to install these you can probably choose the faucet and sink you want. For a little more money you might get a much nicer faucet, sink, toilet, etc. Lighting – you may want to choose LED lights to save money on electricity. For just a little more money now you can save on electricity for years to come. Definitely worth the investment, and better for the environment too. If you do choose to use higher priced materials, and have agreed with your builder to add this or that, make an agreement as to what the overage is going to cost and get it in writing! Not doing so may cause you to end up with a surprise after all is said and done, and the builder tells you the cost is much more than you thought! While concrete is the most common it can also take a long time and require a larger crew than the other options here. Also concrete can end up being very hot (think “pizza oven”) unless you insulate it very well, especially under the roof. Wood is great – light weight and easy to work with and quicker to build with if the design isn’t too complex. However make sure you use wood that will not be eaten by termites, or that it is treated or else you may end up with a house that becomes insect food. These are some of the things to consider. 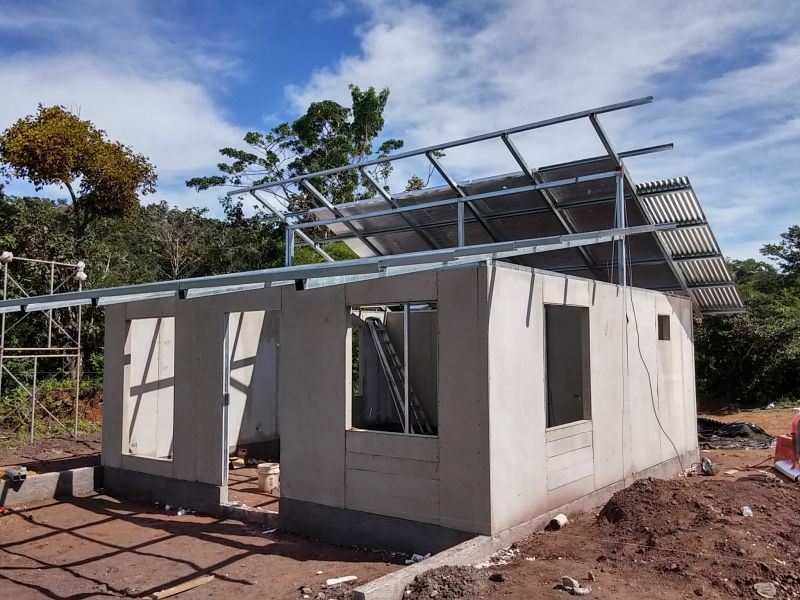 Here are some pictures of a building a house in Costa Rica with SIP panels. I hope this has been helpful and please feel free to post any questions you may have regarding building a house in Costa Rica, below.